Sixteen years after 10-year-old Damilola Taylor was fatally stabbed in south London, the story of his killing and the impact it had on the Taylor family has been made into a BBC One drama. The photograph of Damilola, dressed in his school uniform, smiling at the camera, is difficult to forget. The picture was released after he bled to death in a Peckham housing estate in November 2000 and dominated the newspaper front pages. "It really shook people," says Levi David Addai, who has written the screenplay for a new BBC One drama about Taylor's murder and how his family coped. "How could this happen? A primary school boy coming home got killed. Even today, just saying it, sounds impossible." Taylor had been walking home from Peckham Library when he was stabbed in the leg with a broken glass bottle. He tried to walk the rest of the way home but collapsed in a nearby stairwell. Recalling Taylor's death 16 years on, Addai says: "It really shocked the nation, seeing this young boy full of life and potential, and that was robbed. You can't compute that." Actor Babou Ceesay plays Richard Taylor, Damilola's father, in the drama. He remembers being at university when he heard the news. "The thing that struck me most was the fact that he was 10," he says. "I was a young man and I was really quite taken by that aspect of it. When I realised his age it hit me really badly. "Damilola was also innocent, he wasn't someone who was involved in gangs. Not that a teenager dying from being within a gang is better or worse, but we kind of hope that someone who is outside can avoid that kind of experience." Four youths, including two brothers, went on trial for murder in 2002, but none were convicted. Speaking outside the Old Bailey after the case, Richard and Gloria Taylor vowed to continue fighting for justice - a moment which inspired Addai when writing the drama. "I always remember Richard and Gloria on the steps of the court and their pictures being taken and then them disappearing into a cab, and I was wondering, what happened next?" he says. Damilola: Our Loved Boy attempts to tell that story. The drama opens with a look at the lives the Taylor family were living in Nigeria before they moved to the UK. "People aren't aware that Richard Taylor and his family were actually living a very good middle-class life in Nigeria," Ceesay says. Gloria Taylor, Damilola's mother, travelled to London with her 10-year-old son and his two older siblings - brother Tunde and sister Gbemi. Richard Taylor was working for the Nigerian Ministry of Defence at the time but planned to join the rest of his family in London at a later date. Writer Addai says: "I came up with a rough idea for the drama that was very family focused, and with Richard, Damilola's father, trying to do the best for his family." Richard Taylor was still in Nigeria when his oldest son phoned him to tell him the devastating news that his youngest son had died. Damilola's father quickly flew to London. 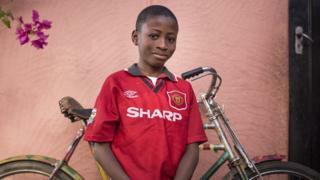 He visited the spot where his son bled to death and spoke movingly about his "lovely boy" at a press conference the day before what would have been Damilola's 11th birthday. Ceesay says: "I hope people empathise with a family going through that. There were five of them and now there's four, and the way in which they've lost probably the most effervescent member of the family, that's so tragic." Brothers Danny and Ricky Preddie, who were aged 12 and 13 at the time, were eventually convicted of manslaughter in 2006 after new DNA evidence came to light. The drama was made with the consent of Richard Taylor, whose wife Gloria died in 2008. "All of the film was inspired the conversations that were had with Richard, Tunde, other family members and friends," Addai says. For his role, Ceesay says: "I was interested in Richard Taylor as a man, this persona that he's got of being completely dignified, which he is, and after playing the character I feel it even more strongly. However, what did he have to go through?" The actor conveys the rage and devastation Richard Taylor felt in the aftermath of his son's death, while maintaining a dignified front. "It's not the most flattering portrayal of him, and he's such a brave, dignified and actually surprisingly playful person," says Ceesay. But the actor did not meet Taylor until after filming. "Before we started shooting, my instinct immediately told me I wanted to meet him, watch his mannerisms and so forth. "But the director said, 'Actually, I think I'd rather see you put yourself through what he went through rather than trying to be Richard Taylor.'" When Ceesay finally met Taylor, he says he found him "compelling", adding: "I think he was aware that if he was there during the performance it would put a lot of pressure on me." Addai confirms: "Richard has been so supportive and is really delighted with the finished product." A year after his son's death, Richard Taylor launched the Damilola Taylor Trust, which Ceesay praises for "doing incredible work trying to connect with young people". The work Damilola's father now does is one of the reasons Ceesay says he hopes viewers take a "positive message" from the drama, "one of hope, one of trying to engage with young people". Addai agrees: "The fact that this family stuck together and were so dignified and held on together, that's what I'd love for people to take away. It's a story of hope." Damilola: Our Loved Boy is on BBC One at 20:30 GMT on Monday 7 November.